Mystic Seaport in Mystic, CT is holding its 66th Annual Dyer Dhow Derby on Saturday, October 17, 2015. The classic 9-foot Dyer Dhows are a mainstay of the Museum’s sail training fleet, and are used in both the Joseph Conrad Overnight Sailing Camp and the community sailing programs. The Derby is a day of racing on the Mystic River held in honor of the yacht clubs, sailing associations, and individuals who have donated to, or supported, the fleet of more than 50 boats at Mystic, the largest fleet of Dyer Dhows in North America. Each Dhow, built by The Anchorage in Warren, RI, is named after its donor. This event is free and open to all who would like to race. There will be Women’s, Men’s, Pairs, and “Quarter Ton” races. 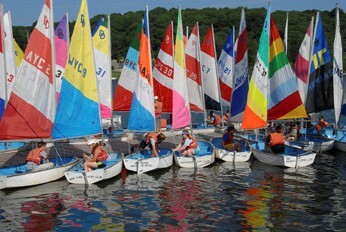 There will also be a junior race early in the day for sailors under the age of 14. Organizations and individuals are encouraged to create teams, and prizes will be given to the teams with the most team swag, most decorated boat, and most spirit. All races will be held on the Mystic River across from the dock at the north end of the Museum grounds closest to Latitude 41° Restaurant & Tavern. Interested parties can register online at mysticseaport.org/event/dyer-dhow-derby/. The 2015 Dyer Dhow Derby is made possible by Gowrie Group.